2. Showing that the statement follows in all cases. It's important to cover all the possibilities. And don't confuse this with trying examples; an example is not a proof. (a) , , or . (d) x is rational or x is irrational. There are an infinite number of ways to divide up the real numbers to take cases; how you do it depends on what you're trying to prove. In general, you should try to use a small number of cases --- and in particular, you should see if you can give a proof without taking cases at all! I'll begin with a logic proof. In this situation, your cases are usually P and , where P is a statement. I can divide the situation into two cases: Either C is true, or is true. These exhaust the possibilities, by the Law of the Excluded Middle. I'll assume each in turn and show that I can derive . Since both of my cases led to the conclusion , and since my cases exhausted the possibilities, I've proved . In logic proofs, cases of the form P and where P is some statement will cover all possibilities, since one of P or must be true. 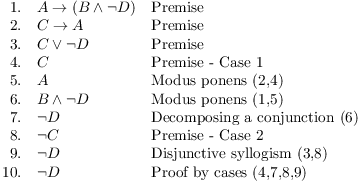 So these are the natural cases to take in logic proofs. How did I know to use C and rather than (say) B and ? I looked at my premises and noticed that I could do something with each of those assumptions: C could be used for modus ponens, and could be used for disjunctive syllogism. As with many logic proofs, it was a matter of looking ahead or working backward. Note: You may use the premises for the proof in either case, but you may not use a statement derived for one case in the other case. For example, in the first case, I derived the statement A at line 5. I may not use A anywhere in the second case. Let f be a function which is continuous on the interval and is differentiable on the interval . Suppose . Then there is a real number c such that and . 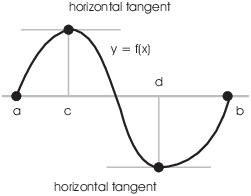 In other words (to put it roughly), between two roots there must be a horizontal tangent. Prove Rolle's Theorem by taking cases. There are three cases: f is never positive or negative on the interval , f is positive somewhere on the interval , or f is negative somewhere on the interval . Suppose first that f is never positive or negative on the interval . Then , a constant function, and for all x in the interval . Suppose that f is positive at some point of the interval . A continuous function on a closed interval attains a maximum value on the interval; since I already know f is positive somewhere, the maximum value of f must be positive. Since f is 0 at the endpoints, it must attain the maximum value at some point c in the open interval . Since , f is differentiable at c. But at a point where a differentiable function attains a maximum, the derivative is 0. Therefore, . Suppose that f is negative at some point of the interval . A continuous function on a closed interval attains a minimum value on the interval; since I already know f is negative somewhere, the minimum value of f must be negative. Since f is 0 at the endpoints, it must attain the minimum value at some point c in the open interval . Since , f is differentiable at c. But at a point where a differentiable function attains a minimum, the derivative is 0. Therefore, . Since the three cases exhaust all the possibilities, this proves that for some c in the interval . Many problems involving divisibility of integers use the Division Algorithm. It is a consequence of the Well-Ordering Axiom for the positive integers, which is also the basis for mathematical induction. I won't give a proof of this, but here are some examples which show how it's used. (a) Divide 31 by 8. (b) Divide -31 by 8. (c) Divide an integer m by 2. In this case, and . Note that holds --- when you divide, the remainder should be nonnegative, and less than the number you divided by. In this case, and . Again, holds. Note that if I wrote " ", the equation is true, but the numbers aren't the ones produced by the Division Algorithm --- r is not allowed to be negative. Of course, the first case occurs when m is even, and the second case occurs when m is odd. If a problem involves odd or even integers, you might consider taking cases in this way. If a problem involves divisibility by 5 you might consider taking cases in this way. Example. Prove that if n is an integer, then is even. Let . I'll consider two cases: n is even and n is odd. Case 1. n is even. Since is an integer, is even if n is even. Case 2. n is odd. Since is an integer, is even if n is odd. Since in both cases is even, it follows that if n is an integer, then is even. Example. Prove that if n is any integer which is not divisible by 5, then leaves a remainder of 1 or 4 when it is divided by 5. Let n be an integer which is not divisible by 5. I want to show that leaves a remainder of 1 or 4 when it is divided by 5. Since n is not divisible by 5, it leaves a remainder of 1, 2, 3, or 4 when it is divided by 5. These four cases exhaust all the possibilities. Therefore, leaves a remainder of 1 when it's divided by 5. Therefore, leaves a remainder of 4 when it's divided by 5. I've exhausted all the cases. This proves that if n is any integer which is not divisible by 5, then leaves a remainder of 1 or 4 when it is divided by 5. This is not the best way to write this kind of proof, since the algebra can be a bit annoying. Proofs like this one can be written more easily using modular arithmetic. Given the way the functions are broken apart, I'll consider the cases , , and . Notice that all real numbers are in one of the three cases. Therefore, holds in this case. Since holds all three cases, it is true for all .